Nothing brings an audience to its feet like a joyous, lively musical number. 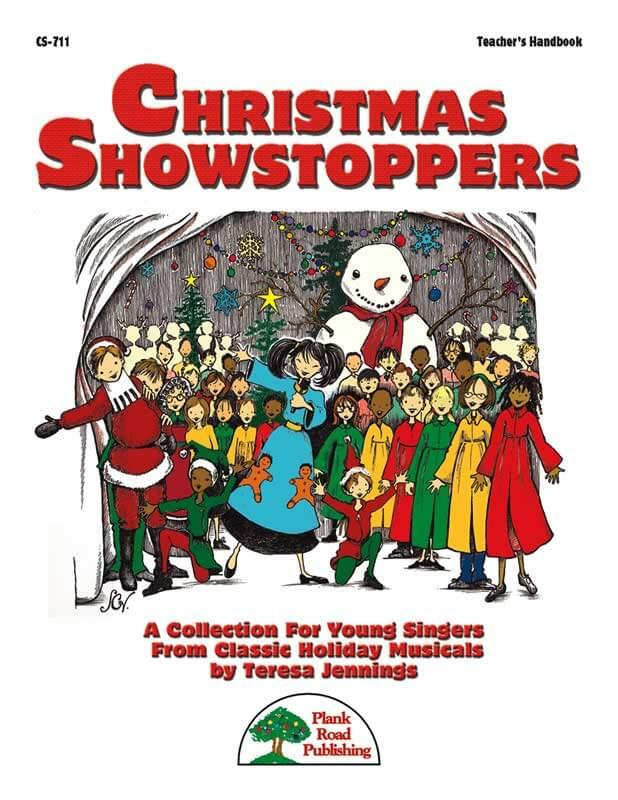 This collection brings together eight amazing "showstoppers" from some of the most popular K-4 Christmas musicals written by Teresa Jennings. Shout! - This is one of the liveliest, most infectious seasonal songs ever written! It's the finale to the musical, How The Penguins Saved Christmas. Sing it once and you'll be singing it for days! Merry Christmas To You From The Red, White And Blue! - Written for the Christmas musical Yankee Doodle's Dandy Christmas, this song positively combines a secular Christmas theme with a flag-waving patriotic theme, making it a unique programming opportunity. And it is simple enough to use with almost any group. You may even have your audience singing along before the tune is over! The Santa Claus Rock! - Set in an up-tempo '50s-style, this finale from The Elves' Impersonator is a natural for any seasonal performance. High energy from top to bottom, it has simple movements built into the lyrics, and others printed on the vocal parts help remind your singers. This crowd pleaser is easy to sing and is usable with kids of any age. Merry Christmas Time - Secular and full of seasonal energy, this festive finale from A Prehistoric Christmas is a great way to open or close any winter performance. It is a natural for groups of almost any age, as it is easy to learn, but has a melody that all of your singers will find enjoyable. Singing By Candlelight - While you may wish to use this lively piece for your seasonal celebrations, there is no mention of any holiday in particular in the lyrics, so it could be used year-round! It comes from Kookaburra's Christmas Down Under. One listen and you will know just how great this song can be as a special feature with battery-operated candles or other similar lights. Christmas Is O.K.! - This joyous hoedown finale from Christmas At The O.K. Corral features a lively fiddle solo on the recorded accompaniment. It also gives your students a chance to do a bit of classic, folk-style square dancing. No one will be sitting still during this energetic number! Sing Of Christmas Time! - A brass ensemble with piccolo trumpet, along with harpsichord, chimes, timpani, and more... it's all here in this majestic song from A Rainbow Christmas. The tune is very simple and repetitive, making it easy to learn. And it's just about guaranteed to put everyone in the Christmas spirit. North Pole Rock 'n' Roll - Everybody loves Teresa's up-tempo winter rock tunes, and this one from Elfis and The Sleigh Riders has become a real favorite. Spirited and ideal for movement, it makes no mention of Christmas or Santa, so it could be used for a variety of winter performances.